Soap scum, hair, and other organic matter are often the cause of slow drains, sewer and septic back ups, and also lead to pest problems and rancid odors. Using Micro-Drain on a regular basis in your home showers,sinks, and bathtub drains will help keep drains free of these problems. 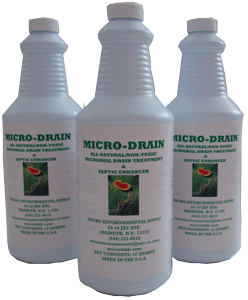 Micro-Drain is unlike other leading products that use toxic chemicals to burn through clogs and are harmful to pipes and septic systems. Micro-Drain uses naturally occurring bacteria to gently break down organic matter and keep water flowing freely. Micro-Drain will not dissolve hair like other leading products , but will loosen the organic matter binding these clogs to help unclog drains. Other products are usually allowed a maximum of 10-15 minutes of dwell time before having to flush them so they do not do damage to pipes. We recommend leaving Micro-Drain to dwell overnight or as long as possible to work on problem drains without any worry of damaging pipes. Micro-Drain will also help enhance and keep sewer lines and septic tanks healthy.